IT JUST MAKES EVERYTHING TASTE BETTER! It seems most people are hesitant to cook on charcoal. Either they don’t know where to start or have had charcoal cooking disasters in the past. Sound familiar? Charcoal cooking is Billy’s preferred method of cooking steaks and almost everything else – because… FLAVOUR!!!!!!!!!! Billy says “There’s more flavour and more love when you cook with charcoal. It just makes everything taste better”! Billy wants to show you how easy it really is. All you need is a few basic pointers and you’ll never look back. 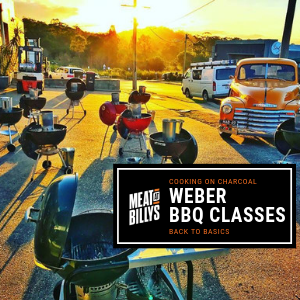 After this class you’ll be firing up your Weber at every opportunity and impressing everyone you cook for. In this Cooking on Charcoal class we’ve limited numbers to ensure you get some real ‘hands-on’ experience. You’ll be cooking and have plenty of opportunity to observe and ask lots of questions. Invite a mate to join you and have some Friday fun! A take home pack including: Billy’s choice of steak, meat rub, 2kg Black Nail Charcoal and some Meat at Billy’s merchandise. 5. Attendance at Billy’s Cooking on Charcoal class involves risk, mostly obvious. You are responsible for your own safety and the safety of your other invited attendees. You agree we will not be liable to you or your invited attendees for any personal injury you sustain. Yes, the attendee is over 18 years of age. Yes, the attendee agrees to the Terms & Conditions of this event.